The Legoutes assist a handicapped student at Foyer d'Amour School. 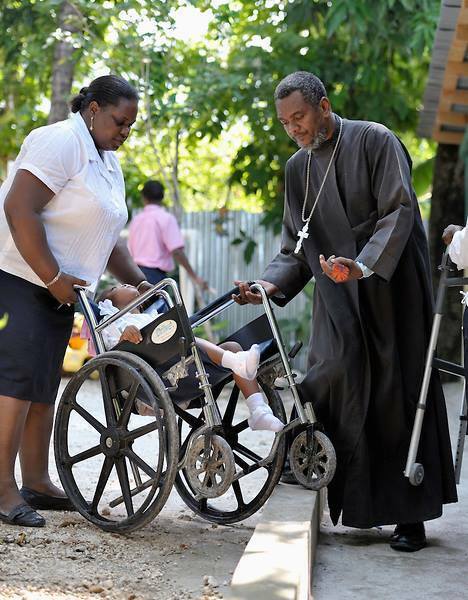 On November 16, 2015, Priest Gregoire Legoute, one of the two elders of the Orthodox Mission in Haiti, died of a massive stroke. He was only 54 years old. May his memory be eternal! A few weeks before his untimely death, Fr Gregoire sent FFA an email. He was a modest man and never asked for help for himself. His last request to us was to conduct an appeal to raise money for Foyer d’Amour, the school for mentally and physically handicapped students that he and matushka Rose founded over 20 years ago. Foyer d’Amour is Fr Gregoire’s labor of love. Wishing to fulfill God’s commandment to care for the “little ones” (Matthew 18:10), the couple cared tremendously for the most vulnerable people in their country. There are around 300 students at the school. Most of them would have been on the street had it not been for the Legoutes and your generous help. Even today, the students you support are fed and clothed here and taught a trade, so they can survive in a country where a majority of the population is below the poverty level and half of children do not attend school. Fr Gregoire’s last request to us was to help his school. Thank you for helping the school thrive throughout the years. Please find it in your heart to continue! Take a look at our video: “Foyer d’Amour – a school that gives hope” on our Facebook and YouTube channels.